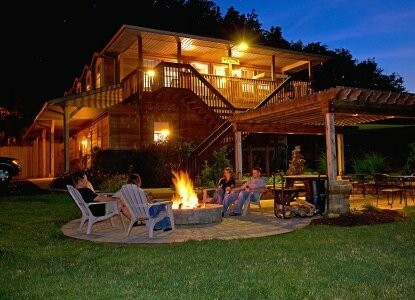 Luxurious Lodge & Log Cabin Suites located on 20 acres in Ohio's Amish Country only 15 minutes from Berlin, OH! Surrounded by rolling farmland, beautiful forests, and overlooking our 3 acre lake. Gorgeous setting with a view of working Amish farms-the view is breathtaking from the decks & porches. Hiking trails through the woods plus a 60 foot wooden bridge! Besides these attractions, relax in front of a gas fireplace underneath gorgeous log trey ceilings. Sip hot tea or gourmet coffee from the decks or courtyards while enjoying a morning sunrise over the lake. 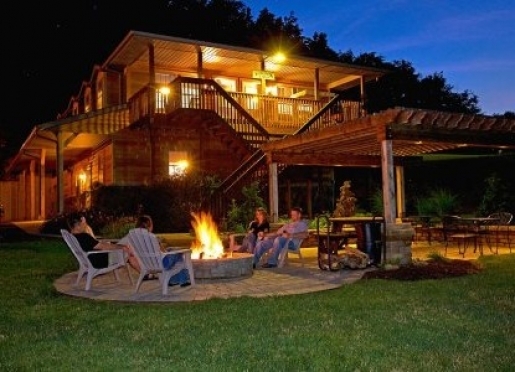 Laugh with friends around the fire pit at night. Explore nature by hiking on our trails through the woods or bird watching by the lake. Sojourners Lodge is definitely a great place for bird watchers. From Canadian Geese, Mallard Ducks, Great Blue Herons, Green Herons, Red-Tailed Hawks, and Kingfishers to Bluebirds, Barn Swallows, and Woodpeckers, there is always something to watch for. Just as the changing seasons bring a different variety of wildlife, it also brings the beauties of nature, such as colorful fall foliage and sparkling ice on the pond. The sunrises over the pond are a favorite of ours, along with the full moon's reflection on the water. Located only 15 minutes from Berlin and Walnut Creek, 10 minutes from Mt. Hope & Kidron and 5 minutes from Winesburg, Wilmot, and Mt. Eaton. Come and enjoy all the seasons at Sojourners Lodge! Travelers are always looking for memorable and relaxing experiences. Let’s discover more through the words of our innkeepers. Many thanks to Duane and Gwen Miller for sharing their own secrets with BBOnline.com! Most travelers stay at our inn to relax in the beautiful countryside, for a romantic getaway, and to enjoy all the fabulous food, shopping, and attractions that Amish Country has to offer! 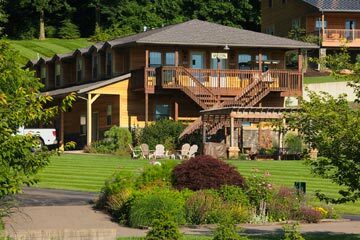 We are known for our spectacular location with amazing views of the Amish Countryside and our immaculate, luxurious suites! Sojourner's is unique because we offer a wonderful combination of countryside and the convenience of being located near a lot of Amish towns so our guests can shop and dine and then unwind in the peace and quiet. I love the log cabin décor, the Jacuzzis, the fireplaces, and the setting! The # 1 reason people come to visit our area is to experience the Amish culture, which consists of quality crafted furniture, home cooked meals at excellent restaurants, horse and buggy rides, plus so much more and just observing the Amish's unique lifestyle. There are too many to pick just one, however I think the biggest compliment comes from the large number of repeat guests that we have year after year! This lets me know that they love our place! The best kept secret is the variety of things to do: from outdoor to indoor activities, there are so many fun things to see and do such as: ziplining, horseback riding, antique malls, flea markets, festivals, restaurants, museums, tours, live music, wineries, cheeseries, bistros, bike trails, golfing, etc. Visit the surrounding Amish towns, where most of the attractions are located, enjoy a delicious meal at an Amish restaurant, splurge on a scrumptious ice cream cone at the Kidron Pizza Place, enjoy sitting around the fire pit at night looking up at the stars, stroll hand in hand on our hiking trails, and unwind on the swinging bench beside our lake! Amish farms, our 3 acre lake, hiking trails that wind throughout our woods, and beautiful country roads to stroll down. My favorite restaurant is Der Dutchman's in Walnut Creek or Boyd and Wurthman's in Berlin, not to mention my favorite pizza place is Park Street Pizza in Sugarcreek Ohio. 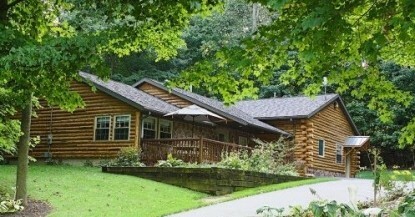 We have 4 Deluxe Lodge Suites and 2 Log Cabin Suites. New Additions: Two new, beautiful, inlaid stone firepits and courtyards at the lodge and at the log cabin! Note: Since Sojourners Lodge is on the Holmes/Wayne County line, CR 37 is also CR 186. This can be confusing when looking at a map, but our directions use the north CR 37 side.